"Glass is an incredible material to work with. I can think of no other medium that enables one to capture light, movement, energy, and fragility instantly as a piece is created. " 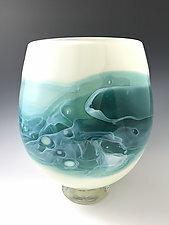 Eben Horton is a classically trained Venetian-style glass maker. He has abandoned notions about the limitations of glass in order to experiement with revolutionary ways of applying color to the walls of his vessels. 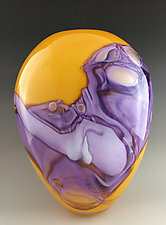 Horton describes his work as "moments in space and time captured within glass." 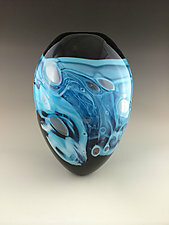 Eben Horton began blowing glass in 1989 at the age of fifteen. 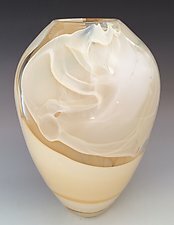 He attended the BFA program at the School for American Crafts and taught glassblowing at the Corning Museum of Glass before moving back to Rhode Island in 2000 to build his own glass studio. He has attended many workshops in glassblowing and has studied glass color making and chemistry with glass artist Peter Vanderlaan.